Members of the House got their chance to take a swipe at the piñata that is the Facebook CEO. If you watched Mark Zuckerberg’s testimony to Congress both today and yesterday, you might have felt like you’re were stuck in some incredibly awkward (and somehow paler) version of Groundhog Day. Lots of the same questions from lawmakers. Lots of the same answers from Zuckerberg. Consumer Privacy: What happened with Cambridge Analytica? What data does Facebook collect? Who has access to that data? Facebook’s Content: Who reviews content? Is Facebook biased? How is Facebook addressing hate speech? Tech Regulations: Do you think penalties would help address problems? What do you think of Europe’s legislation? Will you support my legislation? Facebook does not sell data. I’ll have to look into that and get back to you. So, lots of the same. But some things were different. Let’s get into that. Several House committee members — including Rep. David McKinley (R-WV), Rep. Gus Bilirakis (R-FL), Rep. Kevin Cramer (ND), and Rep. Buddy Carter (R-GA) — think Facebook isn’t doing enough to help the country address the opioid crisis, a topic that came up only in passing yesterday. 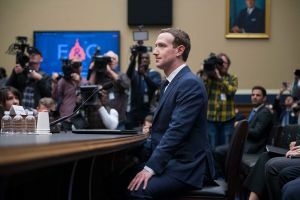 The lawmakers noted that drugs are often bought and sold through illegal pharmacies on Facebook, and pushed Zuckerberg to commit to stopping those pharmacies from posting ads. “With all due respect, Facebook is actually enabling an illegal activity and, in so doing, you are hurting people,” said McKinley. Bilirakis asked for a “definitive” answer as to when Facebook planned to remove the ads (as soon as possible after users flag them, according to Zuckerberg). Cramer was even more direct in his questioning, asking how quickly Facebook would remove the ads if leaving them up resulted in a $1 million fine, possibly hinting at future regulations. We saw a few visual references yesterday, including a hefty printout of Facebook’s user agreement, but House members seem to really like their props. McKinley had images of ads selling opioids, while Rep. Marian Walters (D-CA) prepared screenshots of Facebook’s app and photo privacy settings so she could ask Zuckerberg to explain the difference between them. Later, Rep. Jeff Duncan (R-SC) brandished a pocket-sized copy of the U.S. Constitution during his questioning, noting that he had a copy he wanted to give Zuckerberg after the hearing. There’s a lot Zuckerberg doesn’t know (or says he doesn’t know) that House lawmakers think he should. And they weren’t afraid to call him on it. Rep. Diana DeGette (D-CO) asked Zuckerberg some version of “You’re the CEO, right?” three times when he denied knowing the answer to her questions about Facebook’s goings on, seemingly implying that he should know. Rep. Debbie Dingell (D-MI), meanwhile, was equally unimpressed with his knowledge base, rattling off a list of six “key facts” Zuckerberg said he didn’t know during the course of the hearings. For now, Zuckerberg will get to go home, robotically drink some robot juice water, and take a well-deserved rest. The scrutiny is guaranteed to continue in the morning.